Searching for more operational efficiencies to increase results? Considering how to create business scalability for processes and systems to grow revenue and reduce expenses? Our clients will tell you that Pragmatek knows how to develop sustainable processes and eliminate workarounds for significant payoffs. They say that we know how to streamline processes to gain supply chain savings through improved cash-to-cash cycle time. Our experienced process improvement consultants have worked with hundreds of companies to provide business management consulting and improve business performance with end-to-end supply chain effectiveness. Read our case studies to learn more how we’ve helped others to drive results. Depth and breadth of expertise. The combination of Pragmatek’s expertise in business process improvement, supply chain management and ERP systems has helped companies achieve significant, measureable goals for the past 25 years. Strategic partnership. We bring excellence and integrity in working toward a common goal based on trust and teamwork. You can trust us to guide your team to meet the expectations of your executive management and board members. Significant payoffs. Our goal is to help your company grow and expand by bridging the gap between strategy and process to create measureable efficiencies across the supply chain, sales activities, material flow, and more. These improvements lead to increased earnings, cost reductions and greater productivity. 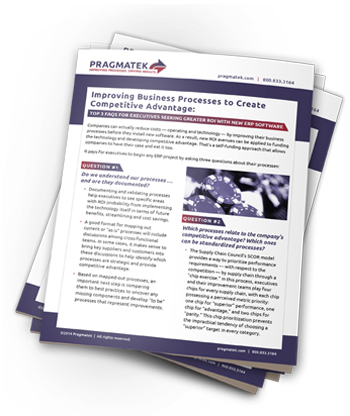 Take the next step to learn more how Pragmatek can help your company. Contact us today.